One of the skulls that either my husband or I have found and cleaned up over the years. I guess its an artist thing...at least this artist. I have always been fascinated with anatomy. I used to study my father's manuals from when he was a medic in World War II. I believe all the copying of skeletons and muscles helped me to develop tremendously in portraiture. 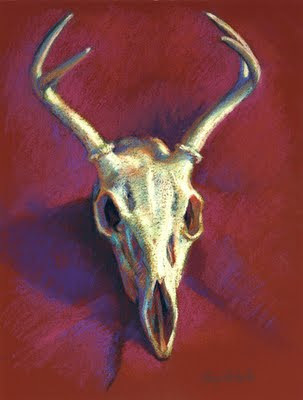 On this particular piece, I was mostly concerned with painting the light and not the minutia of the skull. I was going for drama with the color. It was sad to me that this healthy young buck was shot and ran off to die, undiscovered until he could not be eaten. My husband came across his corpse while taking a leisurely walk in the woods and brought home his head. I find his skull both beautiful and disturbing, just like this story.